MotorGuide’s standard propeller common on many of the production motors. 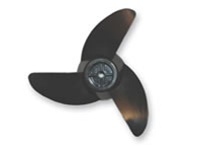 The tapered hub design, by Mercury Propellers, makes this prop extremely fast with excellent overall efficiency. Its weedless performance is very good and it performs on a wide range of motors, including 12, 24 and 36-volt models. Includes prop, prop pin and prop nut.